Today’s featured band has been going strong across six different decades. Obviously, if they’ve been around that long, they’re at the tip of your tongue and a major part of mainstream music, right? Sort of. I can absolutely promise you know half their catalog, but probably don’t listen to them on a regular basis. Having sold 25 million albums in the U.S. alone, they’re one of the top-100 selling artists of all time. Back in 1969, a couple guys started a band in Houston, Texas. It was a three piece, and Billy Gibbons came up with a clever way to make a band name. He was strumming through concert posters and saw a BB King and ZZ Hill show bill that he really liked. His first thought was to be called ZZ King—but determined it was too close to the original name. His next sentence was, “King is going at the top” which landed him on ZZ Top. They signed with a manager who Billy befriended a year prior and recorded two demo tracks but thought the sound just wasn’t right. The other two band members were replaced with Frank Beard and Dusty Hill—and remain together to this day. They didn’t have much interest from American record companies, so they signed with London Records in 1970. Two albums in, they were a commercial flop, with the subsequent touring featuring mostly empty auditoriums. Deciding to change their blues-rock tone to feature a more prominent, heavy guitar sound, the band took off with their next release. The change in sound brought on five straight gold selling albums from ’73 to ’81. 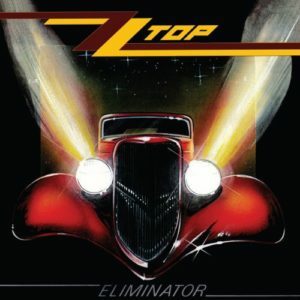 Today I’m listening to their eighth studio release Eliminator, which dropped in March of 1983. The album was an instant success, featuring four Billboard charting singles and huge rotations on MTV. They had starting using a synthesizer sound a couple years prior, but really just experimentation. This album dug deeper into that sound, and it really reinvented their genre. They went from a rock and blues band to almost a new wave type group—which paid major dividends. The album is certified Diamond in the U.S., with nearly 25 million copies sold worldwide. Rolling Stone calls it the 398th best album of all-time and the 39th best album of the 1980’s. It was also the first time fans saw the 1933 Ford Coupe that would become synonymous with the band. Silly as it may sound, building that car exposed them to an audience they simply weren’t capturing. Growing up in the ‘90s as I did, they were still a fairly prominent band, but were not the rock staple they had been with this record and the couple prior. Safe to say I knew who the band was, but most of their music sort of blended together for me. It wasn’t until probably the last 10 years or so, I really started to listen to their individual records. What impresses me is that they just jam away within their comfort zone, and it gets your toe-tapping and gets you to sing along. They somehow made catchy tracks but never got accused of “selling out” or turning pop. Yeah, they have the cool car, the amazingly long beards (well, ironically except Frank Beard who is clean shaven)—but that’s not what makes me listen to the band. It’s the flat out, in-your-face, classic rock riffs they produced over nearly 60 years. You can throw on “Sharp Dressed Man” right now and you’d have no idea it’s nearly 35 years old. ZZ Top still tours and even put out some new material a few years back. All three of them are approaching their 70’s, if like me you haven’t seen them live, the time is now before they hang it up for good. Until then, give this a run today. Show them all your lovin’ and toss $5 dollars their way, you’ll jam right through Tuesday.